Let's be honest with ourselves, folks. At one point or another, all of us wished for our very own Transformer. I mean, come on - who wouldn't want their very own metamorphosing robot pal? Prepare to be excited, awed, and...honestly, a little confused. 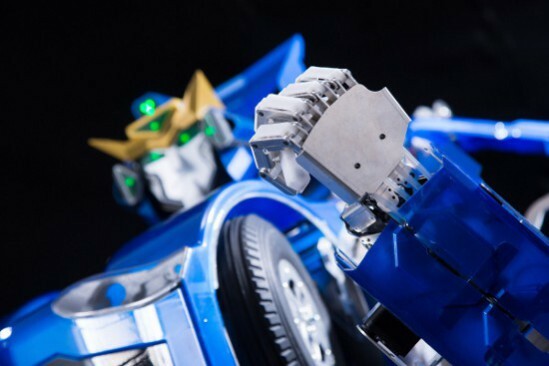 A group of Japanese businesses - among them original Transformers franchise creator, Tomy Co. - have banded together to build J-deite quarter, a fully-functional Autobot. Well, sort of - the robot currently only stands at five feet tall; it's a prototype. The 77-pound J-deite quarter can transform into a three-foot-long, two-seater sports car, capable of reaching road speeds of up to six miles per hour. In humanoid mode, it's able to walk at .6 miles per hour, and sports a set of arms and hands with a full range of motion. The robot - which runs on V-Sido, a proprietary operating system developed by Wataru Yoshizaki of Asratec Corp - is currently only capable of operating for an hour on a single charge. Developer Kenji Ishida of Brave Robotics hopes that by 2020, he and his colleagues will be able to put together a full-sized J-deite Transformer. This robot will be the same size as a real-world car, and capable of transforming into a giant machine on the fly. As yet, it's not entirely clear if it'll accommodate a driver in either mode (though one would assume the car would at least be drivable). In other words...we're at least a couple of years away from having actual Transformers on the streets. Really, that's probably for the best. I'm not entirely certain of the intended use for this product, to say nothing of the legal regulations surrounding a giant car-bot. How exactly would you go about clearing an Autobot for civilian roadways? You can read more about J-deite and J-deite quarter on the project website. Be advised, it's written in japanese.